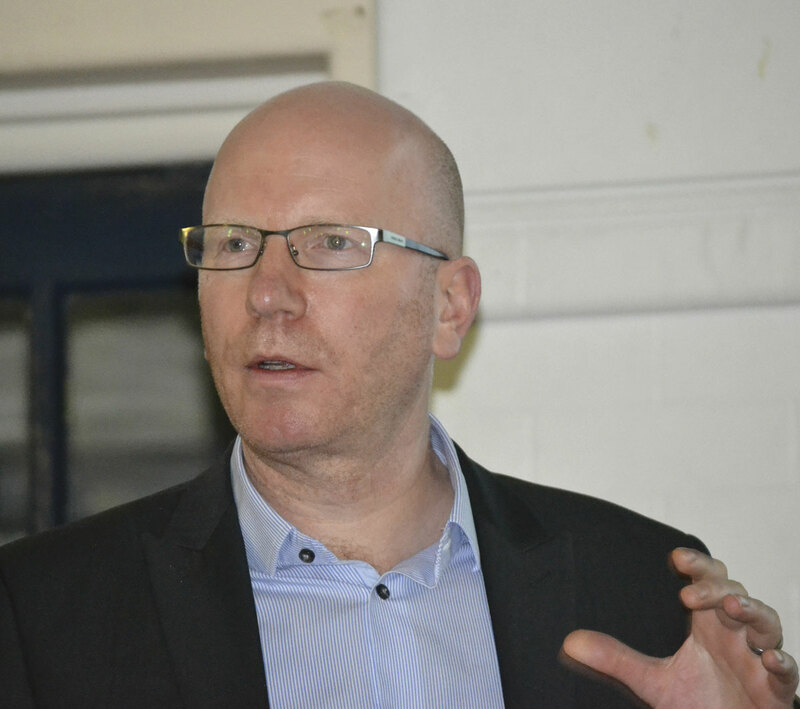 The Seven Kings School, Ilford was once again the setting for the Borough’s annual one day transport compliance event, which encompassed a conference and exhibition. 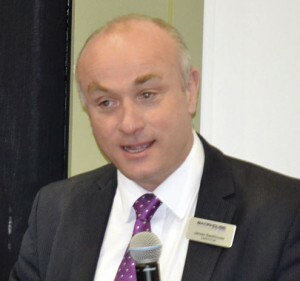 The first show was in 2012 and was specifically aimed at increasing turnover for the Council by targeting the utility sector and other fleet markets it didn’t have contact with as part of its usual ‘day to day’ operations. Redbridge was one of the coach suppliers to the Olympic Games and the first presentations centred around the impact of these games. 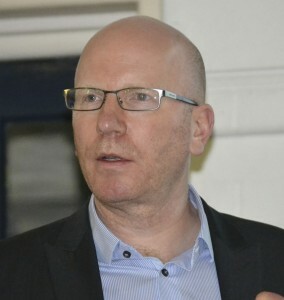 There were some 180 registered delegates and James Hookham, MD, FTA, opened proceedings, informing those gathered that the previous night’s curry event had been well attended, raising just over £1,000 for the family of one of the council’s ex-technicians who had been killed recently in a road traffic incident. Beverley, who had also attended the curry night, was the first guest speaker of the day and anyone who has heard her speak (outside of a public inquiry) knows that she is an amusing orator. She began by asking those assembled whether they were having a good day or a bad day? The purpose of the question became apparent later. 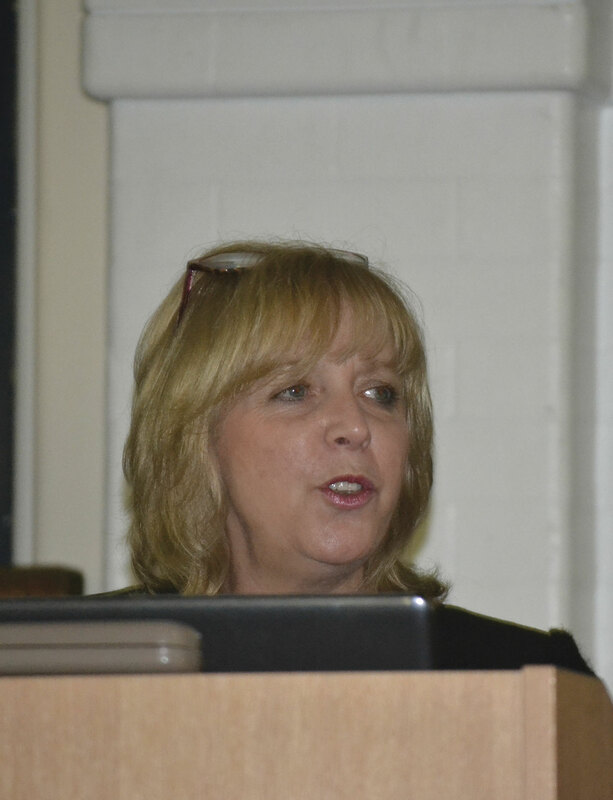 Her presentation was based on her 17 year career as a Traffic Commissioner, six of them in the Senior role, and what had changed since she joined in 2000, when there were no smart phones, no sat navs and emails in the Leeds office were hardly ever used. There was no congestion charge, no Euro6 and TfL was still in its infancy. 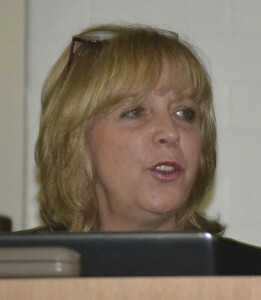 Beverley then spoke of the Sowerby Bridge and Bath tipper truck accidents that had both resulted in fatalities and that these incidents had occurred 20 years apart, suggesting that not much had changed in that time. This led back to the good day, bad day question and how outside influences affect your job, admitting that when she has a stressful day she pours herself a glass of wine and hides in the garage whilst having a cigarette! The audience were asked how many had an occupational road risk policy, and a show of hands showed that it was around a quarter. She stressed the importance of making it clear that drivers know exactly what they can and can’t do and that this policy should be supported with a health and safety and wellbeing policy. She posed the question, what are you doing as employers to support your staff? A real life case example was given whereby an employee had been fiddling his tacho to get home to support a disabled relative living with him, because he feared, if he had told his boss, he would be sacked. Beverley said that as employers, you have a duty of care and it is important that behaviours are monitored and addressed. In conclusion, she said that the issues in 2017 and 2007 were ‘probably the same’, there was ‘probably political unrest and probably financial doom and gloom.’ She told us to ‘train to the highest standard, we have the best road safety system in the World.’ She closed by saying that it had been a privilege to serve as a Traffic Commissioner. David Wood and Mark Horton from the DVSA gave a whistle stop update on the Earned Recognition scheme, which is due to pilot in April for a potential ‘going live’ date sometime in Autumn. I’ve covered this scheme quite a bit in the past so will just focus on the updates. As this is a voluntary scheme, there are qualifying entry requirements and operators will need to remain compliant as initial acceptance doesn’t guarantee continued ‘membership’. To qualify, all operator licenses of the legal entity must be included and must have been held for a minimum of two years, additionally there should be no Traffic Commissioner regulatory action within the last 24 months. All operators within the scheme are subjected to a third party audit. The DVSA has approved a number of auditors and have worked with them on the KPIs (Key Performance Indicators) that will become part of the assessment. I asked Dave whether they recognised existing ‘excellence’ schemes and audits and it was suggested that the DVSA would advise that these were amended by the awarding body to avoid repetition and additional costs for the operator. The scheme in itself is free to join but charges in terms of audits will be market led. There are eight main KPIs, which cover O licence, the Transport Manager, vehicle standards, driver hours, operational management, driver management, driver behaviour and training and driver related policies. Service work is also audited should it apply. These compliance monitors are measured four weeks in arrears. In order to remain within the scheme, safety inspection records must be 100% and vehicles must have an initial MOT pass rate of 95%. It raised the question whether this was fair and we were advised that there were tolerances built into the KPIs. Regarding driver KPIs, the type of activities monitored will include; working time directive, unaccounted mileage, repeat offenders, fixed penalties and overall infringement rate. The operator’s existing IT systems must be compatible with the auditor’s and the DVSA have worked with a number of the industry’s main providers to try to alleviate any potential teething problems, however it was suggested that there may well be a cost implication to operators if their systems are incongruent. There will be a six month pilot phase starting 1 April where all the processes will be fully tested but details of the results and participating operators will not be published. Operators, data suppliers and auditors wishing to be involved in the trials can contact the DVSA for a pilot pack. 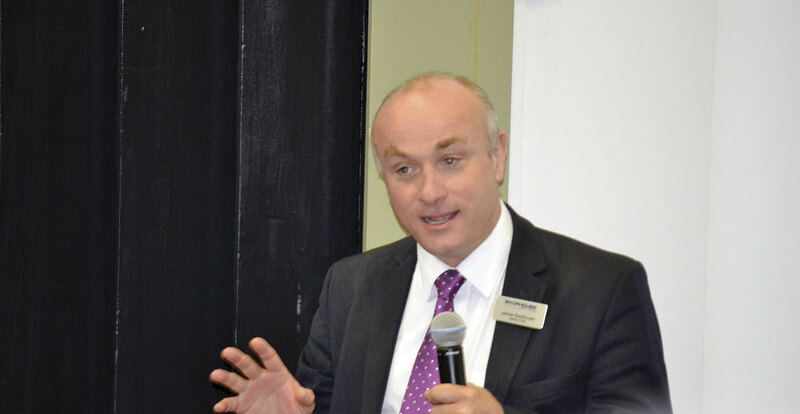 Mark explained that, from an enforcement perspective, there will be a single justice process, where the offender will appear behind closed doors in front of a Magistrate and clerk, but this will only apply in straightforward cases. He said that, following intensive research, they have been working with Polish company Inelo Tachoscan since October 2016 to produce data including infringement and control reports and manipulation warnings which would be triggered for example if a tachograph was removed. The FTA welcomed the scheme, but James Hookham commented that much more information, particularly regarding KPIs was required. 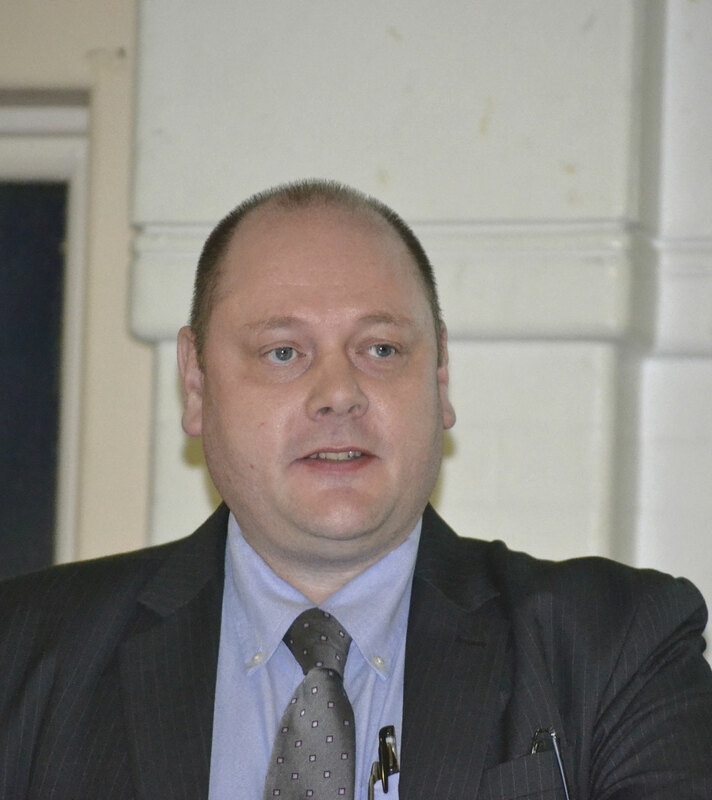 Director and Solicitor James Backhouse’s presentation was entitled ‘If I could turn back time’ and was the last presentation that was specifically relevant to PSV operators. It focused on what to do in the event of a serious accident, from contacting the family of the driver, to offering counselling and of course, employing a lawyer. He offered some excellent advice such as not making recommendations to the driver as to what you think that they should do, for fear of skewing the police investigation and asked the audience to consider whether they may be even partly responsible by considering the condition of the vehicle and the driver. 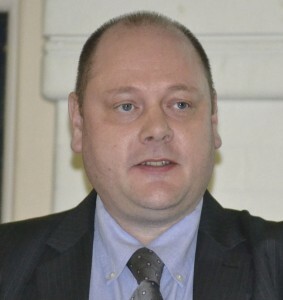 James estimated that 25% of serious accidents that the firm have dealt with have been due to medical conditions, affirming Beverley’s point on monitoring drivers’ behaviours. He closed with a quote from Lord Saville reminding us that, ‘The size of the error does not bear any relationship to the size of the accident.’ He also suggested that in his experience, driver hours and tacho auditing seems to be the industry’s Achilles Heel and suggested that a review should take place in your operations if you hadn’t done so in the last two years. The event was supported by 57 exhibitors ranging from clothing to minibuses and software to tyres. A large marquee housed supplier stands whilst the garages and outside areas were used to display the larger exhibits. The heating and air conditioning specialists showcased a number of their products at the show. Their systems were fitted on three Stanford Coachworks vehicles; one from the host Redbridge Council, a London Hire vehicle and one of Stanford’s own demonstrators. In addition, the Nu-Track Pulse demonstrator, which was also at the event, was fitted with a full climate system from Eberspächer. The company is the preferred supply partners to both Stanford Coachworks and Nu-Track. For contact and further information please contact [email protected] or telephone 01425 480151. 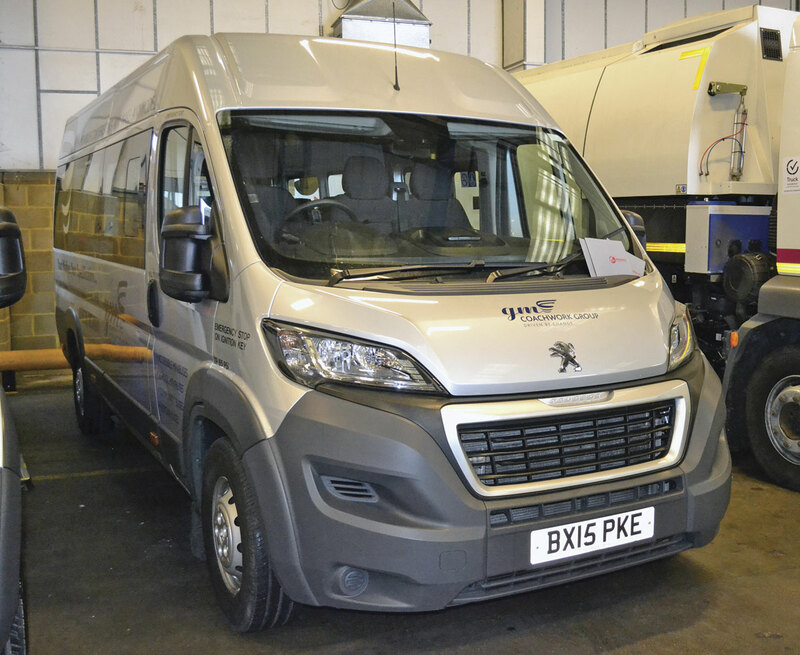 A customised extra long wheelbase Peugeot Boxer was exhibited by Devon based GM Coachwork. 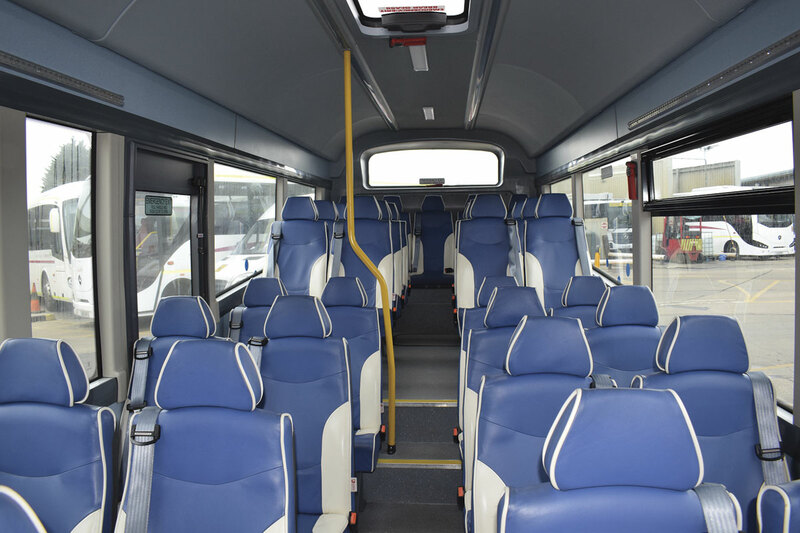 The vehicle has been adjusted to improve seat legroom and height and is fitted with Unwin Innotrax tracked flooring system and Altro non-slip flooring. The eleven seats are from Phoenix and are fully removable. Entrance is via a low access roll out step and a fully electric tail lift from Braun is fitted to the rear. Their Sales Manager for London and the South East, Jeff Caswell said of the event, ‘The show was as always very well organised with the curry night being as popular as ever. There was a very good mixture of vehicles there with lots of companies represented and some great contacts made during the day. 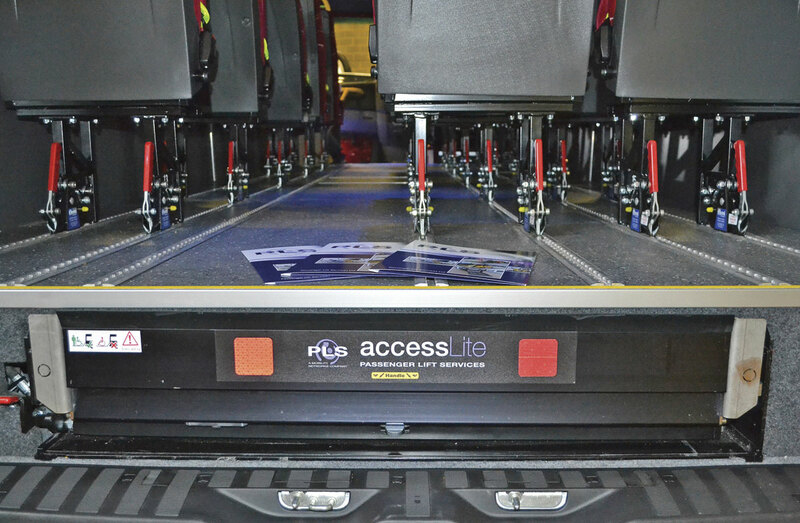 Wheelchair accessible vehicle product specialists, Koller, supported the show by supplying key products from their portfolio, including the EXCEL 120 Combined wheelchair restraint, which they claim to be the first product of its type on the market. 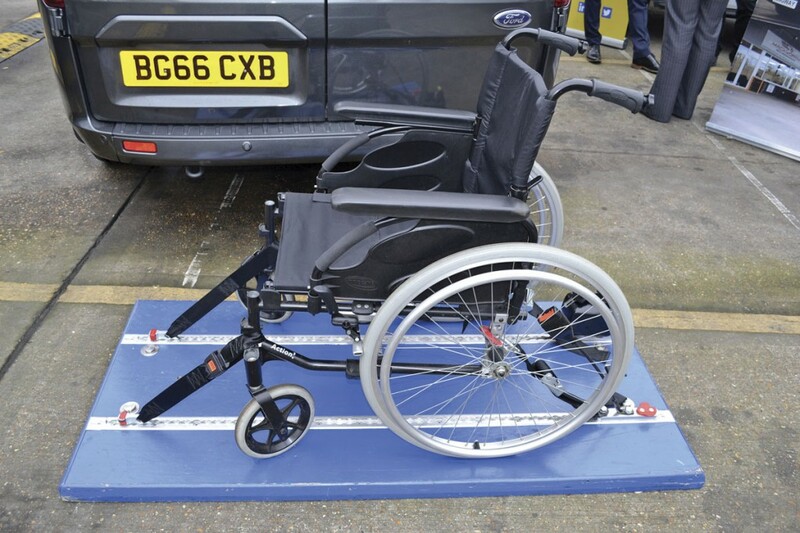 The product has been designed to secure a forward-facing wheelchair of up to 120 kg and one passenger and includes the stringent safety test requirements of ISO 10542 to ensure customer’s peace of mind. It has been continually improved to provide a durable, space-saving and cost-effective restraint. Features include: EXCEL Compact rear tie-down straps for increased adjustability, double-plunger rear rail clips for strength and a simple to use, universal TITUS harness for maximum passenger comfort and safety. 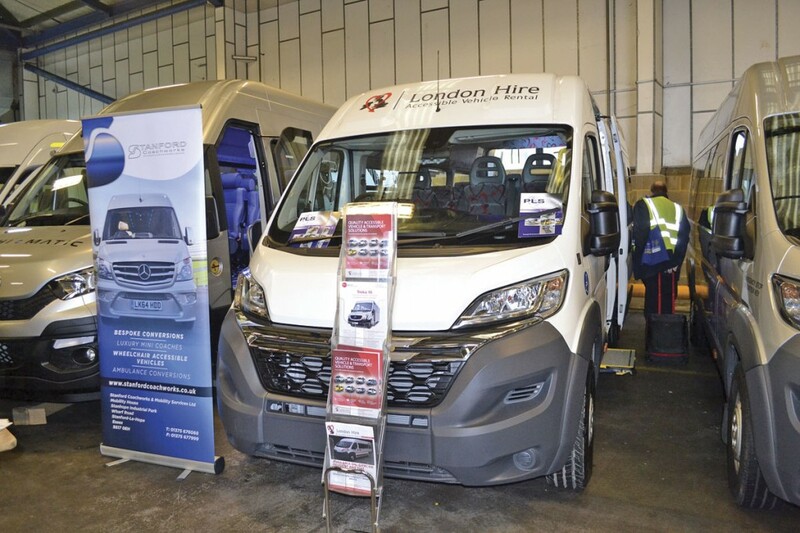 Peter Moxham and John Shier from community transport specialists, London Hire were on hand to discuss the two vehicles they exhibited at the event. Their first was a brand new Citroen Relay L4 H2 LWB accessible van conversion, which was one of 17 that they are having built for a customer on a long term contract. The build, which was undertaken by Stanford Coachworks, features an in-board split platform PLS lift, a Webasto heating system and 14 Cogent seats fitted on NMI legs. They also showcased a recently renovated 7.5 tonne Mercedes Mobile Library which is available for sale. Nu-Track, part of the Wright Group, had two demonstrators available for visitors to view. The 33 seat Pulse is based on a 10 tonne MAN TGL chassis with MAN Tipmatic automatic gearbox and in-line four cylinder 4.6litre engine. The vehicle can be adapted to carry up to ten wheelchairs. The second vehicle on display was the Nu-Track Nu-Vibe. The low-entry Nu-Vibe has been developed from the Wrightbus Streetlite and uses the same Cummins Euro6 engine and Allison automatic transmission driveline, but it is narrower and is directly wheelchair accessible via the side entrance. The demonstration Nu-Vibe has 33 seats but various configurations available mean that it can accommodate up to four wheelchairs. Both vehicles are M3 Test Approved. Phoenix Seating is celebrating its 15th year in business this year and to celebrate, they have new ranges which will be introduced later this year. They had a variety of seating from the popular Blenheim range featured at the event. These included the standard Blenheim, the space-saving tip and fold Blenheim Optimum Spacesaver, which features a tip up seat and pivots on its pedestal to fold into the side of the vehicle and the adaptable Blenheim Shuffle. This tip up seat is easily ‘shuffled’ forward in its tracking to maximise wheelchair access in the back of a vehicle, without the removal of seats. The vehicles featuring Phoenix Seating seats were; London Borough of Redbridge Sprinter, featuring six Blenheim and nine Blenheim Shuffle seats; Stanford Coachworks Iveco Daily, with 16 Blenheim seats and GM Coachwork’s Boxer featuring seven Blenheim, one Blenheim Shuffle and one Blenheim Optimum Spacesaver. 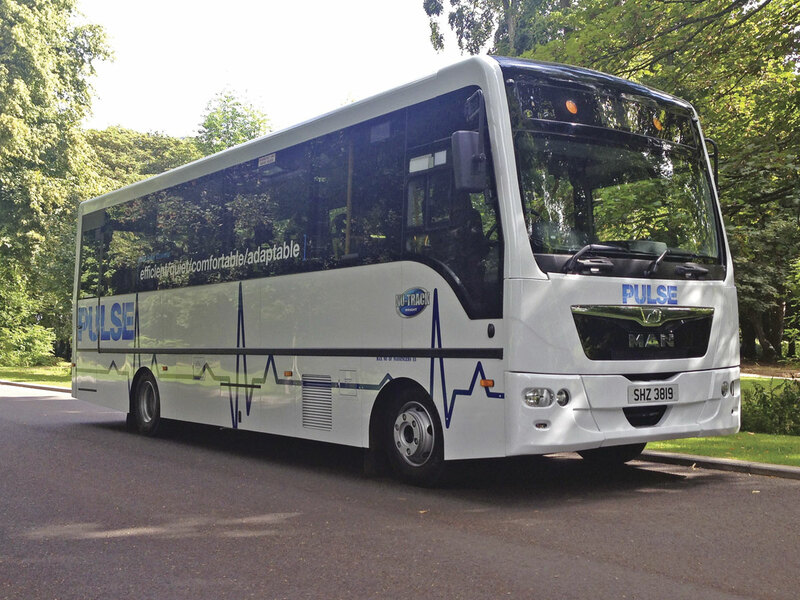 Nu-Track’s Nu-Vibe bus also had 33 Blenheim seats whilst there were two in Unwin Safety’s demonstrator. Representatives from Phoenix Seating were available for any questions and enquiries. A number of vehicles were fitted with PLS lifts, including The London Borough of Redbridge Sprinter built by Stanford Coachworks. 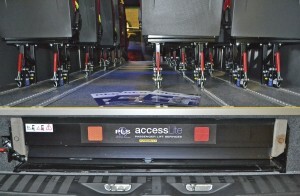 The floor has been especially adapted to house the Access Lite Cassette Lift so that it is not stored under the vehicle where corrosion and damage may occur. 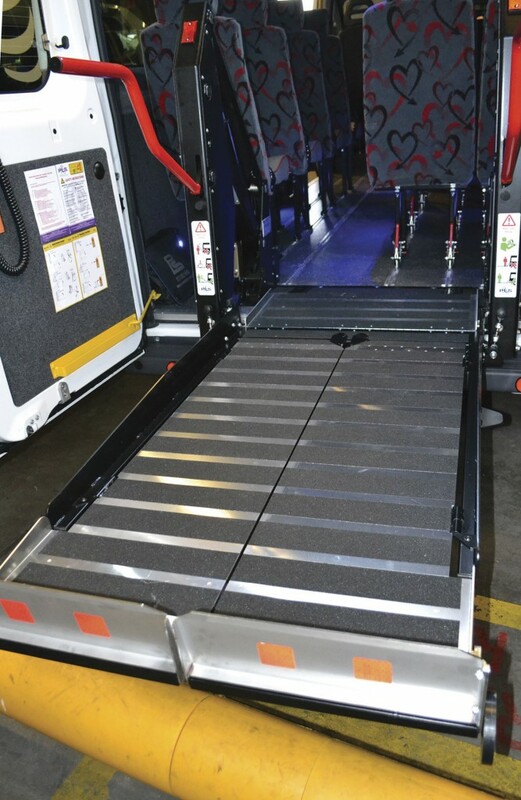 London Hire’s Citroen Relay, also built by Stanford Coachworks was fitted with the latest version of their Mini-bus Inboard Lift, the MK3, which is 25kgs lighter, has an improved ant-twist platform lock and three button operation for added safety. This was the first year at the event as an exhibitor for Chesterfield based clothing specialists Pride and Joy, having attended last year as a visitor. Based in the marquee, they displayed some of their sports team seat headrests along with branded ties. MD Jane Phillips said that she had been made to feel very welcome by the organisers and saw it as a good networking opportunity. A Mercedes-Benz Sprinter with extra Long wheel base was built for the London Borough of Redbridge. It was fitted with a PLS concealed cassette lift within the super flat floor. Seats were courtesy of Phoenix Seating and Eberspächer provided the climate control system. Their second was the Iveco Daily 4100L demonstrator with flat floor, Phoenix Seating and Ratcliff Tail Lift. A Citroen Relay for London Hire with M2 tested floor, seats from Cogent Passenger Seating and PLS internal tail lift, completed the line-up. Director at Stanford Coachworks, Jess Rider attended the show. There were a number of other suppliers to the industry and these included; CILT, Complete Hydraulics Continental (Tyres), Dawson Rentals, Unwins, IRTE, Michelin, Q’Straint and Rescroft Seating. This was another great event from LBR and long may it continue.